Tokyo has an extremely high population density. They have about 10million people living in an area about 1/5th the size of Sydney. It’s also the central working hub for people who live in the greater Tokyo area. Around 20 million people travel into and around Tokyo every day. As many will be aware, rail and metro infrastructure in Tokyo is extremely good. The station density is also extremely high with 142 metro stations and almost as many train stations just in Tokyo. It’s rare to find yourself in a street and not be able to see an entrance to a train or metro station. The busiest station (Shibuya) handles more than 3 million people every day and there are many stations within a kilometer of it that also handle large numbers of people. To put it in perspective, Shibuya station handles as many people in 4 days as Central station in Sydney does in an entire year. Train/Metro is the primary form of transport for Japanese commuters. In Japan, rail travel is fairly expensive relative to income (particularly the metro). Children will catch the train to school as this is cheaper, but the metro is much more expensive. It is customary in Japan for employers to pay for the transport of their employees to and from work. This acts as a kind of tax to help make the lines financially viable. It is very rare for workers to commute in any way other than by public transport. There are almost no parking spaces anywhere in Tokyo. Even tradesmen will need to park their vehicles at a company depot before commuting home via rail. It’s also rare for workers to commute by bicycle (at least salary workers anyway). It’s broadly discouraged because of insurance risks to the company (although as I was on an assignment covered by travel insurance it didn’t really impact me). Some transportation jobs are done by bicycle/cargo bike and police often patrol using bicycles as well. Bicycles are very heavily used by non-commuters. This is because the rail is expensive if your company isn’t paying for it. Most cyclists will be women with children (Japanese culture is still mainly that the wife quits work to look after the kids) as well as retired people. It’s not legal to own a car in Japan unless you have somewhere to park it on your property so almost no one owns one in Tokyo since property/land is so expensive. I never met anyone who I worked with that owned a car (company was a few hundred people). The only person I did meet, lived 2.5 hours out of Tokyo. If you ride up the Arakawa river on a weekend (a bit like Parramatta Valley Cycleway but about 4 times the width and it goes for 80km) there are a number of sports fields along the track and you will see hundreds of people cycling to kid’s sport games. Its not unusual to see a whole soccer or baseball team arrive on bikes carrying all their gear in baskets/backpacks etc. since there is no parking anywhere. This includes netbags with 14+soccer balls. From what I could see, the train/metro is used heavily if you are commuting to work or if you are fairly wealthy but otherwise bicycles are used for all other forms of transport. There were generally no explicit separated cycling facilities in Tokyo when I worked there. There are a large number of one way streets for cars where bicycles are allowed to go in both directions. There are no marked lanes though. There is also more a bias in the traffic light sequences towards pedestrians than in Sydney where pedestrians always get a green light on the left side of the intersection when cars get a green so cars need to wait until all pedestrians have finished before turning left. Cars do get a right arrow without pedestrians walking though. Tokyo is also full of back streets that are too narrow for cars and these are regularly used by utility cyclists. As the majority of cyclists are mothers with children or retirees, bikes tend to avoid the wider (faster) roads and use footpaths. Its normal to see people transition regularly from footpath to road and back again. When riding on group rides in Tokyo, we regularly filtered down the left lane during traffic jams. Hook turns were also used heavily by us, particularly as most intersections are “no right turn allowed”. I don’t have a huge experience here and Japanese traffic police generally have no knowledge of English. I do know that the law operates based on automatic fault applying to the operator of the heaviest vehicle. If you hit a cyclist while driving a car, you are stuffed. The medical bills will be huge and then you can be sued for very large amounts of money as well. The flip side of this is if a cyclist hits a pedestrian, then the cyclist has a huge problem. With the exception of some taxi drivers in Roppongi (Kings Cross of Tokyo) on a Saturday or Sunday morning, car drivers are extremely passive around cyclists. I believe this is partly from a cultural perspective, but also from a legal standing as well. Cars in Tokyo still move quite slowly because of the traffic jams anyway. 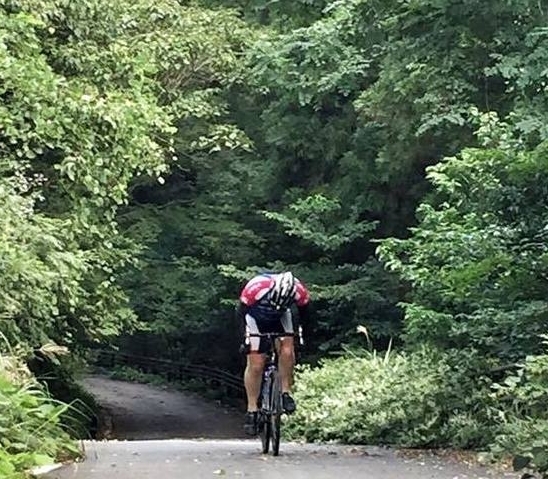 Helmets are not compulsory in Japan. They are rarely worn, unless by people riding for exercise. The child seats on the mum bike “Mamachari” have raised protection above the child’s head height which acts as a kind of helmet, as well as neck protection. This raised protection would prevent the fitting of a helmet in most cases anyway. I commuted most days over a distance of 1.5 kilometres. I was the only person in the office to do so. It took about 8min vs 10-15min for the metro. I never rode to meetings at customer offices which were always done by metro/rail or sometimes taxi. 1. The most common non-sport bike is the mamachari which is typical city bike. Generally 1 chainring and hub gears. They will have baskets and 1 (or sometimes 2) child seats on them. 2. Folding bikes. Generally Japanese brands. These are popular because often apartment blocks only have a fixed number of bike spots per apartment so additional bikes need to be stored indoors (Bike parking is like car parking spots in Sydney). These bikes are often bought at the equivalent of a K-mart but the quality is much better than what you would get in Australia for a K-mart bike. 3. E-bikes are becoming popular with mothers of growing children and also retirees. If we rode down the back lanes on weekends you will often see very old Japanese men and women (>>80 years old) on e-bikes going about 10-15km/hr. e-bike share facilities are now starting to pop up (particularly in Yokohama just south of Tokyo) and I suspect this will grow as well. I only ever saw the regular lower power e-bikes used in Tokyo (I assume max speed of 25km/hr). The brands were always Japanese (typically Yamaha) and didn’t see any German brands like Bosch like you do in other countries. They were also starting to become a bit of a status symbol in a similar way to cars in Australia. I remember a work colleague who was having a financial discussion with his wife on when they could afford to purchase her an e-bike rather than use a regular mamachari. Culturally the Japanese (and Japanese women in particular) don’t like to sweat as its perceived as being unclean so an e-bike is becoming highly desirable for transportation. I believe that Japan had a large price range of ebikes where you could pay a much smaller amount (~$1000) for a very simple one with prices increasing from there. Switzerland (and from what I’ve seen in Australia) the minimum prices starts at ~$5000 but for a much better quality one. E-bikes are often used by older people to get around and if you ride in the alleyways, you need to be aware of very old people on ebikes who seem to have no knowledge of their surroundings and will regularly stop or turn corners without signalling.